Due to High Demand, this product is currently Sold Out. 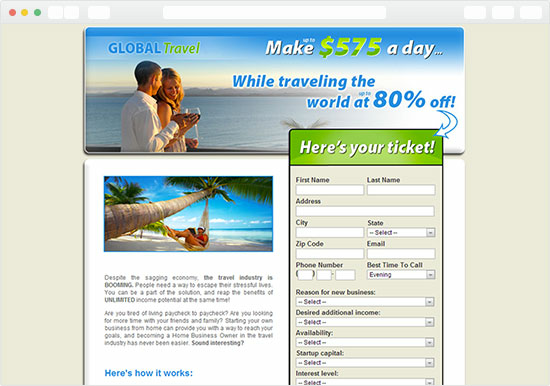 Expand your travel business! These semi-exclusive leads have specifically requested interest in a home-based Travel business. Options available to select by Gender, by Country (US & Canada), by Time Zone and to send (redirect) the lead to your personal website. Each lead is delivered in real-time! This means that as soon as a prospect completes and submits their information on one of our home business opportunity websites, it is immediately emailed to you. If you make contact with the lead immediately, they will be amazed you called so quickly.